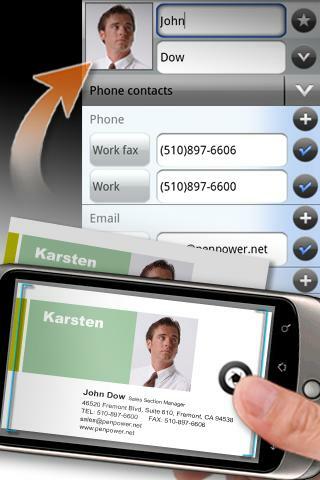 Export Business Cards to Your Droid With Worldcard Mobile! This is the best and fastest business card reader & scanner I have ever seen. Just imagine an app where you can take a picture of a business card and the contact details are imported to the contact list, right away. It is almost unbelievable. All you need is just a tap and the details of the business card are now in your contact list. The app’s perfect recognition and high accuracy are a result of the OCR technology that is used. rel=“nofollow”> Capture the image of a business card, select your language and tap on recognize. This is what you need to do to import the contact details from the business card to your Android contact list. If you want to add any other details to the contact, you can add it with the help of the EDIT option. The unique feature is that you can even import the details from your photo gallery if you have taken the picture of the business card before. The other feature is that you can directly import the details from the contact list also. Go to your contact list, select ‘Add contact’ and it will display the app and you can import the contact details. This app supports 7 languages like English, German, Spanish, Dutch, Portuguese, French and Italian. You can rotate the image and zoom in to view details. I have installed this app in my Android HTC Wildfire and it works really well. I would highly recommend this app to all business people. As most people find it difficult and irritating to get the contact details of a person from a bunch of business cards, my advice is to just discard all your business cards and install this one single app to collect all your contact details. It is really easy to use, has a high rate of accuracy, doesn’t involve manual work and most importantly, it saves a lot of time.